North Korea is warning the South to stop broadcasting anti-North propaganda across the border though loudspeakers by Saturday or face a strong military counter-action. The North's deputy UN ambassador, An Myong-hun, told reporters in New York the army does not make "empty talk." An said the broadcasts constituted "an open act of war" and that North Korean leader Kim Jong-un has ordered troops near the demilitarized zone to enter a "quasi state of war." U.S. and South Korean troops have resumed joint military exercises after a highly unusual interruption. A Pentagon official said Friday the maneuvers were suspended this week after an exchange of artillery fire between the North and South along the western end of the border dividing the two Koreas. Assistant Defense Secretary David Shear said U.S. officials wanted to coordinate with the South Koreans after the shelling between the North and South. "When events like this take place, we talk to [South Korea] to get the facts straight about what happened and to discuss how we are going to respond," he said. Shear refused to give any other details, but said U.S. forces in Korea entered the exercises on an "enhanced" state of alert and remain so. Tensions grew earlier this month when South Korea accused the North of planting landmines that exploded near the border two weeks ago, wounding two South Korean soldiers. 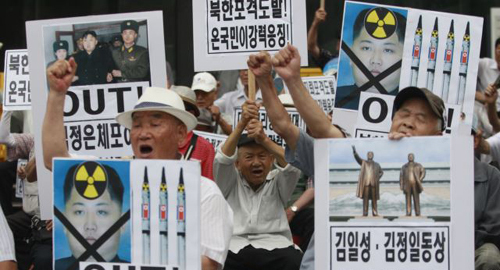 North Korea is accusing the South of trying to provoke a war.